What Will My Laser Treatment for Spider Veins Cost? At Celibre Medical Corporation, three factors play into how much laser treatment of spider veins will cost: the number of veins you have, the severity of them and which treatment is necessary to give you the results you’re looking for. Since these factors vary from person to person, the cost of treatment will too! Our practice offers two effective treatments to get rid of unwanted spider veins: sclerotherapy and vascular laser treatments. Sometimes, patients will need one or the other or a combination of both the make their legs look good again. Sclerotherapy is a treatment that requires very precise, skillful injections of sclerosing solution into larger to medium sized blood vessels. Treatments usually cost around $300-$600 per session depending on the amount of treatment you need and the time your treatment takes to complete. Laser treatments tend to be a bit quicker, but they also require skill and knowledge in addition to state-of-the-art equipment. Again, the cost can vary due to a mix of these factors along with the amount of vessels or areas there are to treat, but generally, $300-$500 per session is what you can expect to pay. We know that cost is a top priority for our patients. But we also believe that there’s value in results. We want our patients to get what they pay for! That’s why we offer a completely individualized, custom-made plan that’s just for you using any or all of the latest, up-to-date methods available to treat spider veins. We work hard to make sure we give you the best results in the shortest number of treatments. That’s why we believe we are unmatched with any other practice when it comes to providing cost-effective treatment of unwanted spider veins! Come in and see us today and let us get started on a plan for you! 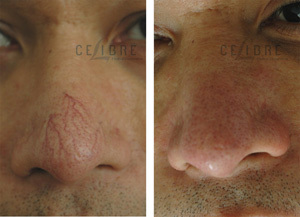 Contact Celibre today and get the best value and results from your spider vein laser treatment!